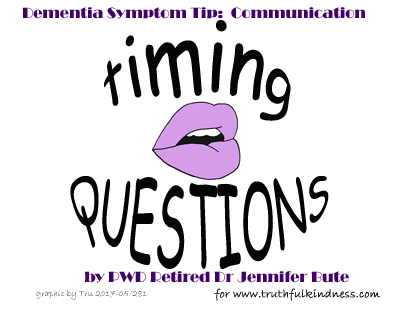 With her permission, the below Dementia Symptom/Relationship Tip is excerpted from retired doctor Jennifer Bute’s FaceBook page, https://www.facebook.com/gloriousopportunity/. 2017-05/25. is a good communication tip! So often people try to be friendly but start by asking us questions, which can make us ‘freeze’ inside, as we are not good at ‘quizzes’. But we don’t want to appear rude by saying so, and have probably forgotten what we were meant to be remembering while considering how to respond, so we ‘freeze’ inside. This makes us appear reluctant to talk or even appear mute, when we would really like to be part of the conversation. However if you say, “I remember when..” it is as if the current of the conversation helps us to move along with you and we can then often join in and once we get chatting things become much easier.